The health benefits associated with including the superfoods kale and blueberries regularly into your diet can be astounding. And turmeric is a delightfully delicious spice that packs a powerful immune-boosting, inflammation-fighting, antioxidant punch to help you stay healthy and strong. 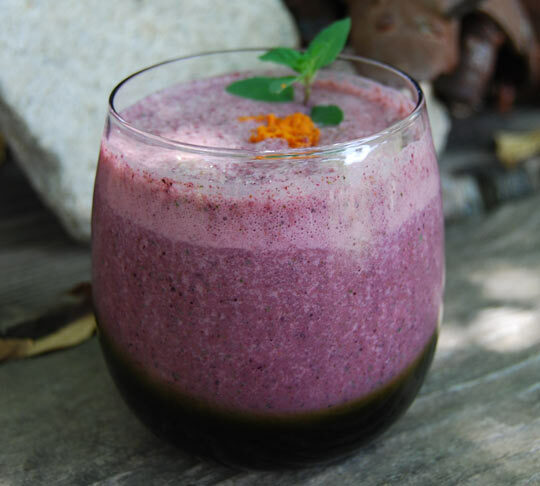 If you're in a hurry and can't spare the time to chew up all that healthful fiber, or if you just want a delicious way to prepare these nutrient-dense treats, this smoothie recipe is certainly for you. Add all ingredients to a blender and blend until smooth. Note: Frozen blueberries and/or ice will make the smoothie thicker. Add water or more almond or coconut milk to reach the consistency you like. You can learn more about the health benefits of blueberry and kale in this informative article, "Kale and Blueberries: September Superfoods." Find out more information about the amazing properties of turmeric at turmeric.com.